I mean chats and businesses are not even in the same league. Chats are supposed to be the fun way of interacting with people. Business on the other hand is … let’s just say essential for this world to exist the way we know it. For all those who think that business chats can’t be fun or effective, the developers of Troop Messenger have an answer that proves them wrong. This team chat app incorporates all the fun of an instant messenger and at the same time addresses the concerns that a business might have. we proceed further, we’d like to emphasize the fact that has been foretold by many scholars — communication and collaboration are pillars of success for an organization. 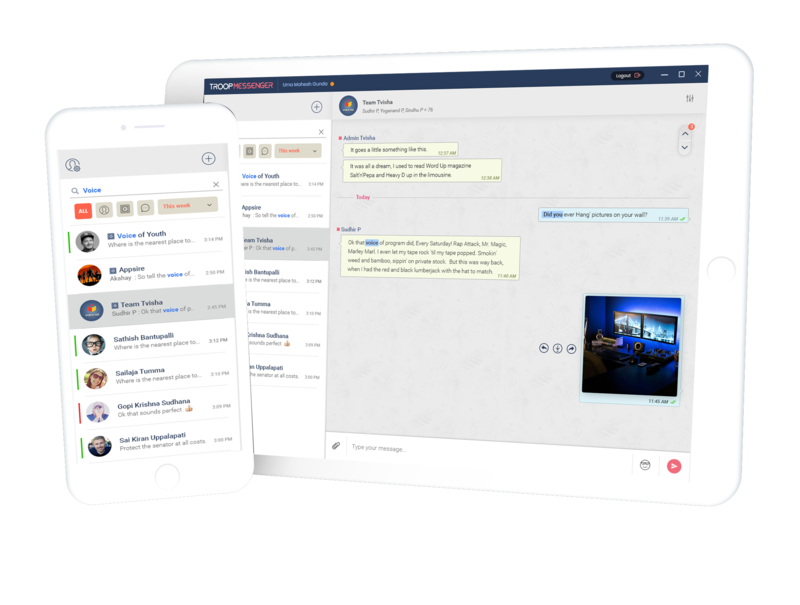 Troop Messenger bears these essentials in its soul and brings you a load of features that not only help in keeping the communication and collaboration effective but also address the security concerns of an organization. Off late there has been a debate that messaging at an office isn’t very beneficial. Advocates of this ideology have provided very reasonable arguments that it makes employees indulge in gossip and often communicate with people outside their organization. They also point out the amount of time that is wasted on searching for files in the instant messenger along with the effort it takes to clear up the history so that employees don’t run out of space on their devices. While some of those concerns might be genuine, studies have shown that instant messaging is actually a faster way to get a work done especially when it comes to collaboration and is, therefore, more productive. More importantly, when there is team chat app such as Troop Messenger, it makes team collaboration more effective. It has many remarkable features that make it a next-generation app. This app is not only compatible with a wide range of operating systems but also takes much lesser space to install. It provides a server-side security for higher data protection. Although it allows multi-tenancy, the companies that use Troop Messenger can be assured that the data of each individual is kept separately. It has a massive storage size of up to 1 TB so users don’t have to worry about running out of space. With such massive storage, the chat history can be pretty humungous and can lead to many issues. It makes searching for information or files one of the many dreadful tasks. Troop Messenger addresses those concerns by making its chat history completely searchable and also allows some data filters that can be used to search files in the chat history by their type. It has an interesting feature called self-messaging that allows users to send ideas that they want to share with anyone. It lets employees communicate with users who are part of their organization and restricts them from contacting those outside the organization. Its group chat has features of administrators as well as moderators that make the collaboration of a work over instant messenger more effective. Features such as the ones mentioned here make the Troop Messenger one of the potential game CHANGERS.